Were atomic bombs detonated on American soil? And (at the time) Soviet soil? And on extended territories of these and other nuclear powers? Yes. No nuclear enemy was even needed for our greatest fears of nuclear war to be realized. All we needed was ourselves. And the deed is already done. According to U.S. Department of Health and Human Services, Centers for Disease Control and Prevention, and the National Cancer Institute: "Any person living in the contiguous United States since 1951 has been exposed to radioactive fallout, and all organs and tissues of the body have received some radiation exposure." According to Rebecca Solnit in Savage Dreams: "Radiation can make cells lose their memory, and loss of memory seems to be one of the cultural effects of the bombs too, for Americans forgot that bomb after bomb was being exploded here." Of course, American tests affected the health of their neighbours as well, as fallout polluted Mexico and Canada. Similarly, other nations' nuclear bomb tests irradiated other countries. In wartime, these impacts could be viewed through the same lens with which we view Hiroshima and Nagasaki. But the mid-20th century introduced new mass media narratives to invert reality, so that we would see media realities before we would see real realities. Those media narratives paint neither atomic bomb and hydrogen bomb tests, nor industrial nuclear pollution, with the same brush as the bombs which ended World War II. With these precedents set, communication in the new Millennium need not concern itself with reality in order to be taken seriously. After World War II, much was made of avoiding Nazi-styled propaganda and guarding the public's capacity, expressed through the free press, for criticizing the government and other authoritative actors in the economy and society. The only trouble is that there are layers of truths, some of which are so deeply internalized or confused that they are not openly acknowledged. What good does it do if the media may speak freely, but no one can see reality for what it is, including members of the media? The US Atlas of Nuclear Fallout 1951-1962 Vol. I Abridged General Reader Edition. Nuclear tests give an example of internalized truths and how the media and public may not recognize them. One of the blog's readers, JS, kindly sent me the link to this 2004 article, "Mutant Ecologies: Radioactive Life in Post–Cold War New Mexico," by Joseph Masco, in which Masco argues that the short lifespan of insects makes them the first real reflectors of irradiated landscapes. In the 1950s, giant insect horror movies helped to purge fears of fallout. But after the Cold War, these landscapes became 'nature preserves,' which soothed those fears into a comforting message about remedies for the traumatized environment. While each U.S. citizen negotiates the traces of Los Alamos science in their bodies and biosphere—making each of us real or potential mutants—the nuclear future remains highly mobile. Consequently, [I investigate] debates and practices involving new “species” logics in the nuclear age, examining how the pursuit of security through military technoscience has raised questions about the structural integrity of plants, animals, and people. A concept of mutation implies ... a complex coding of time (both past and future); it assumes change, but it does not from the outset judge either the temporal scale or the type of change that will take place. It also marks a transformation that is reproduced generationally, making the mutation a specific kind of break with the past that reinvents the future. Engaging the U.S. nuclear project through the lens of mutation ... privileges not only the institutional and technoscientific networks needed to construct the bomb but also the wide-ranging and long-term social and environmental effects of the production complex itself. 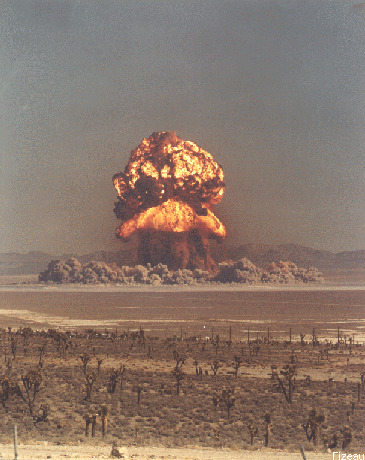 The ecological effects of atmospheric nuclear testing, for example, may not be fully realized for decades, and an understanding of their cultural effects requires an investigation into the different conceptions of nature that inform local communities. The world produced by the bomb, however, is structured by its totalizing scale (the entire planet) and by more localized, multigenerational effects that are highly changeable, rooted in any given moment as much in ambiguity or latency as in material fact. The 24,000-year half-life of plutonium, for example, presents a multimillennial colonization of the future, requiring a different temporal analytic for investigating radioactive ecologies. Here is one for generational myth-makers. Those who conducted these tests were members of the fabled 'Greatest Generation.' Before we even get to the irradiation of North America (see map here), it is hard to imagine a greater evil conceit than the one which devised radiation containers for trapped pigs in Operation Plumbbob, during which 29 nuclear bombs were detonated in Nevada in 1957. See the scene with radiation test pigs in metal containers starting at 19:50 in the video below, Operation Plumbbob: Military Effects Studies, which was declassified in 1997. Operation Plumbbob: Military Effects Studies. Video Source: Youtube. Pigs, dogs, sheep, cows, monkeys, and mice were used to test the effects of radiation on different species, utilizing skin, lungs, eyes, blood, and genetic material as a test of how radiation exposure traumatizes a biological being in the millisecond of an atomic blast and over longer periods of time as the mutagenic effects of radiation exposure occur. The protected body of the Cold Warrior, increasingly rendered as cyborg in the cockpit of planes and other military machines, was thus prefigured by the vaporized, mutilated, and traumatized animal body. Former military personnel for this and other nuclear test projects have their own battles to fight, because they were directly irradiated too. Further afield, it is estimated that between 1,000 and 20,000 North American people have died from thyroid cancer caused by Plumbbob radiation fallout alone. It is no wonder that everything gives you cancer became the catch phrase of the late Cold War and post Cold War eras. Operation Plumbbob video with detonations and pig experiments. From: Trinity and Beyond: The Atomic Bomb Movie (1995) by Peter Kuran. Video Source: Youtube. -Masco's article was published in Cultural Anthropology, Vol. 19, Issue 4, pp. 517–550, ISSN 0886-7356, electronic ISSN 1548-1360. I previously blogged about nuclear legacies here - and generally, here.